Marie Rose Therriault, 86, a life-long resident of Winooski, died peacefully in her home surrounded by family, on January 27, 2016, after a courageous battle with cancer. Marie was born on February 11, 1929 to the late Edward and Theresa Delage. She married her late husband Henry Therriault Sr. on January 6, 1951 at St. Francis Xavier Church. They spent 26 happy years together before he passed away in 1977, leaving her a widow for the remaining 38 years of her life. She spent most of her life devoted to raising and caring for her family. 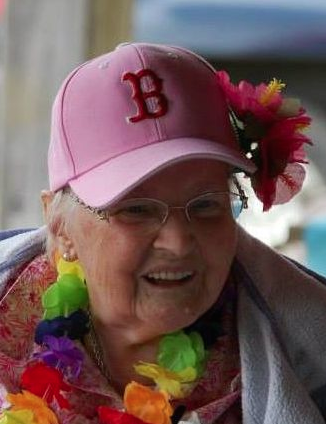 The most important things in Marie’s life were her Catholic faith, her family, her friends, and of course the Boston Red Sox. She will be deeply missed by all who knew and loved her. Marie is survived by her 10 children Theresa (Marcel) Cote, Marie Cote, Diana (Leon) Provost, Pauline Daggett, Gloria (James) Greenwood, Henry (Kathy) Therriault Jr., Michael (Deborah) Therriault, Richard (Penny) Therriault, Christine (David) Hamilton, and Kathy Therriault, as well as 30 grandchildren, 39 great grandchildren, 10 great-great grandchildren, and numerous nieces, nephews, and cousins. She was predeceased by her husband Henry Therriault Sr., her brother Jean Delage, her sister Rita Paquette, 5 grandchildren: Kevin and Donna Cote, Todd Provost, Edward Daggett, and James Hamilton, one great granddaughter, Samantha Sun Barnes, and two son-in-laws: Roger Cote and Francis Daggett. In lieu of flowers, donations can be made to the VNA Adult Day Program on Prim Road in Colchester. The Family would like to give a Special Thanks to Kathy and Nicole for Everything. Visitation will be from 4:00pm to 7:00pm Monday February 8, 2016 at LaVigne Funeral Home and Cremation Service, 132 Main St., Winooski, VT 05404. A Mass of Christian Burial will be at 11:00AM Tuesday February 9, 2016 at St. Francis Xavier Catholic Church, Winooski. Condolences may be shared at lavignefuneralhome.com.